Cohorts represent the main source of data used by Lifepath researchers to pursue the project goals. A cohort is a group of people who have something in common, such as age or social class, or who share a common experience within a defined period. They are used in several disciplines like medicine, social science, ecology or psychology, above all to investigate life history traits of specific segments of populations. These groups or sub-groups of people undergo a passive follow-up about traits that are relevant to the aim of the study. As for Lifepath, these traits are socio-economic factors (like education or income), outcomes and clinical tests (like blood pressure or cognitive functions), and biomarkers (like glucose or insulin levels). Each cohort has its own set of traits available, as shown by the infographic below [click to interact]. Lifepath researchers aim to identify and trace the biological changes that underpin the effect of environmental, behavioural and social factors on health conditions and aging. To do so, for each cohort they will integrate clinical and biological data with four selected socio-economic variables – education, occupation, income, father’s occupation – together with age, marital status and ethnicity. They will apply this method to all the project’s cohorts and compare the results. Future analysis might require different and more specific sets of socio-economic traits. In this way, they will obtain a huge set of data that will help them to find and study correlations between socio-economic conditions and biological modifications that may result in altered health status. Whitehall II (also known as the Stress and Health Study) is a longitudinal, prospective cohort study established in 1985 to examine the socioeconomic gradient in health among employees in the London offices of the British Civil Service. The Irish Longitudinal Study on Ageing (TILDA) is a large prospective cohort study examining the social, economic, and health circumstances of community-dwelling older adults resident in the Republic of Ireland. Generation 21 (G 21) comprises a cohort of newborns recruited in 2005–2006 in the Porto Metropolitan Area, in northern Portugal, at the five public maternity units that are responsible for 95% of all births in the region. Airwave Health Monitoring Study is an ongoing long-term epidemiological occupational cohort study open to all police forces in UK, launched in 2004 and aimed at investigating any possible impacts of TETRA (Terrestrial Trunked Radio) on health. The EPIPorto is a general population-based cohort of adult dwellers in Porto, established between 1999 and 2003 using random digit dialling. Its aim is the evaluation of the major determinants of cardiovascular health. The Swiss Kidney Project on Genes in Hypertension is a longitudinal family-based study, following the standardised EPOGH (European Project on Genes in Hypertension) protocol, aimed at exploring the role of genes and kidney haemodynamic in blood pressure regulation and kidney function in the general population. Baseline examination was conducted between 2009 and 2013, followed by a currently ongoing examination. The CoLaus (COhorte LAUSannoise) is an ongoing prospective study assessing the clinical, biological and genetic determinants of cardiovascular disease in the city of Lausanne. The initial survey was conducted between 2003 and 2006, with a follow-up 5.5 years later. Growing Up in Ireland (Ireland) is a longitudinal child cohort established in 2007/2008, which took place over seven years and followed the progress of two groups of children of different age ranges, with multiple socio-economic measures of their parents. The European Prospective Investigation into Cancer and Nutrition (EPIC) is a large European study on diet and cancer. Its Italian component recruited adult volunteers at five centres: Varese and Turin in northern Italy, Florence in central Italy and Naples and Ragusa in southern Italy. The E3N study (Étude Epidémiologique auprès de femmes de la Mutuelle Générale de l’Education Nationale) is a prospective cohort of 98,995 women aged 40-65 years at recruitment in 1990 and it constitutes the French component of EPIC. The National Child Development Study (NCDS) is a birth cohort established in 1958, which follows the lives of over 17,000 people born in England, Scotland and Wales in a single week in that year. Understanding Society is an innovative UK household longitudinal panel study established in 2008 that captures information about the 21st century UK life, looking specifically at its participants’ social and economic circumstances, attitudes, behaviours and health. The GAZEL study was established in 1989 among employees of the French national gas and electricity company, Electricité de France-Gaz de France (EDF-GDF) and it is based on an annual questionnaire used to collect data on health, lifestyle, individual, familial, social and occupational factors, and life events. The CONSTANCES cohort was established in late 2012 and was designed as a randomly selected representative sample of French adults aged 18-69 years at inception. 200,000 subjects will be included over a five-year period. 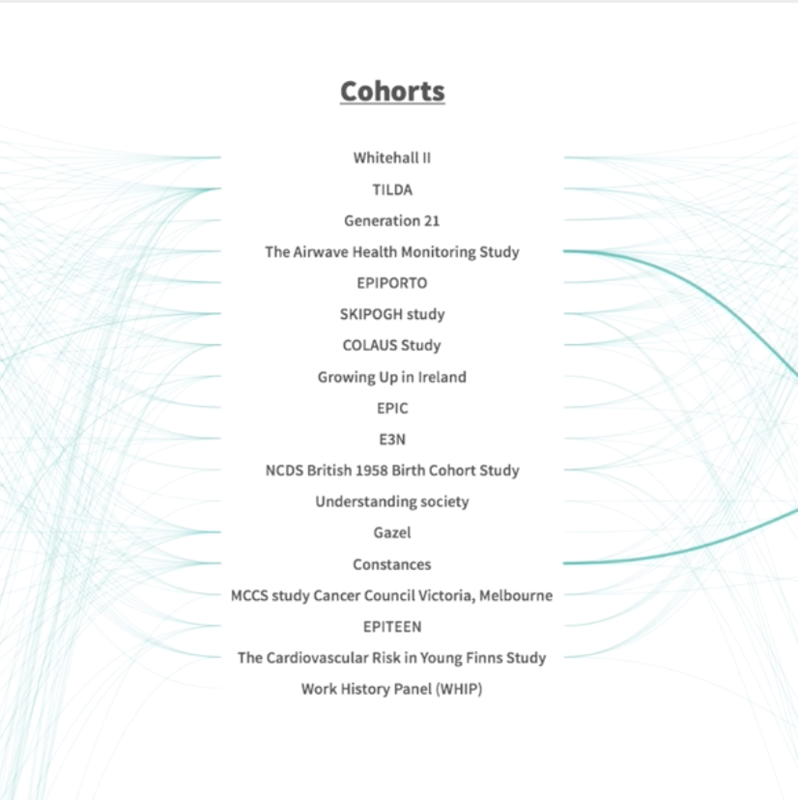 The Melbourne Collaborative Cohort Study is a prospective cohort study of people living in Melbourne, Australia, recruited in randomly selected census districts. It was designed to be the largest prospective cohort study conducted in Australia and it included 30% southern European migrants. The Epidemiological Health Investigation of Teenagers in Porto (EPITeen) cohort intends to follow adolescents from initial adolescence to adulthood stage, in order to study behaviours and chronic diseases like cardiovascular diseases in a life course approach. It is based on a random sample of thirteen-year-olds enrolled at public and private schools in Porto, in 2003-2004. The Cardiovascular Risk in Young Finns Study (YSF) collected data on children and adolescents at different age steps, who were randomly chosen from the population register of five Finnish cities with universities with medical schools to produce a representative sample of Finnish children. The Work History Panel (WHIP) is based on a sample of individual-level data from the Social Security Administration archives in Italy, covering almost 8% of all Italian workers employed in the private sector in 1985-2010.